Where is clear, but what happened at Mossley and when? It certainly attracted a good crowd who look to be Edwardian period. This photo was taken on 20th October 1911. The strange wheels, axles and springs are the remains of a tramcar. 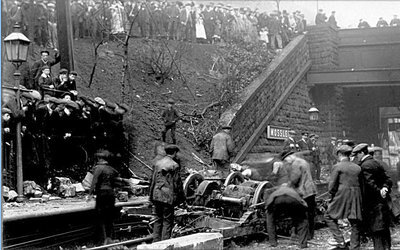 On that morning about 5.30am the tramcar, packed with early-morning workers, was coming down a steep hill above the station when it got out of control, left its rails and plunged into the railway cutting. Five people in the tram were killed. I have a photo of this scene and the caption states five were killed and four injured.